This is a great wallet that is built to last! Bison leather is an incredibly durable leather that only gets better over time. 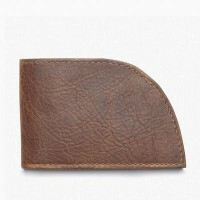 Our Front Pocket Wallet in Bison is slim, lightweight and fits perfectly in your front pocket. Note: Bison leather is a natural product and will have variations in grain and color.